This is a stellar 1 oz, 1.95” by 0.9” by 0.8” blackspot light smoky DT Tibetan quartz, so named from the carbon included within – purifying and distinctive. 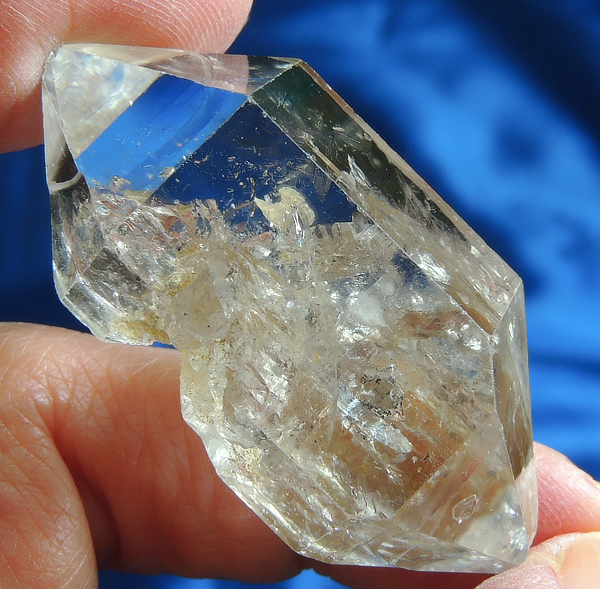 The spots are sparse, but, get out your loupe and look little calcite crystals included within! And interestingly, he has curved areas on his terminations. He is slightly smoky with a bit of golden healer … and at one time, he contained a large enhydro. In the drastic temperature changes of Tibet, the water froze and “blasted” out the side. I’ve seen this happen with crystals shipped during the winter when the enhydro is large. The area is healed through the eons but he clearly demonstrates he is a survivor! He has one generator (Merlin) termination and is in excellent condition (only a few tiny dings) otherwise. If you have never felt the energy of a Tibetan before, you are in for a real shock! His energy is sweet and clear with a distinctive high vibration that resonates with perfection with angelic song. I recently told a friend that it is far too easy to misunderstand a person than to understand him/her. If we merely adopt an attitude of allowing, the understanding is a natural effect. If we only listen for the beauty in the angel’s song, then that joy fills us and all we have is acceptance – it is out gift. The rainbow is but seven colors with an infinite number of expressions. A song is but seven notes, also with an infinite number of expressions. Such beauty and such wondrous knowing!!! We ARE All That Is and All That Is, is a part of us! This Spirit teaches us that we can indeed manifest the beauty and joy of angel songs in our life – and once we have that tune, we will hum it constantly! Enjoy his sweet energy!